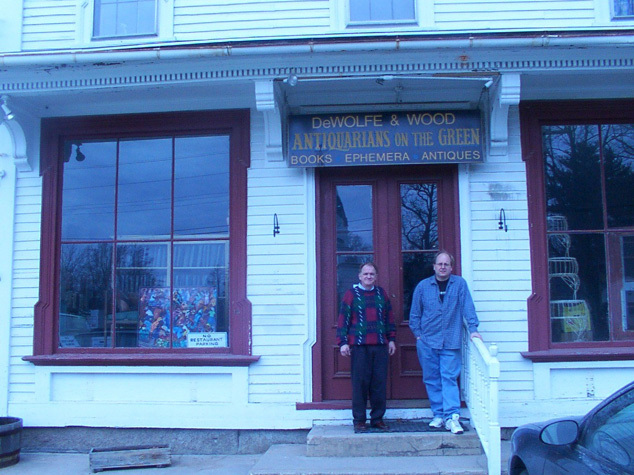 Frank Wood (left) and Scott DeWolfe in front of their Maine bookshop. There are books everywhere. If the image of an old bookshop is shelf upon shelf of books, books in boxes, books in piles, room after room of books, then this is the quintessential bookshop. It’s not always quite so extreme. As the proprietors explain, they just purchased a collection of 20,000 to 30,000 books, and now they are in the process of figuring out where to put them all. The proprietors are Scott DeWolfe and Frank Wood of DeWolfe and Wood Books. They sell books and other printed material all over the country and overseas from their shop in Alfred, Maine. Alfred may not be regarded as the capitol of the printing industry, but it works just fine for these experienced booksellers. And today the shop is filled with the large collection belonging to a Maine professor who recently passed away. While there’s variety in the collection, the focus is Judaica. Judaica? In Alfred, Maine? Is there some unseen spiritual connection to this small town? Yes there is. For almost a century and a half, Alfred was home to a large Shaker community. Both Frank Wood and Scott DeWolfe have studied and collected Shaker material for most of their lives. If you have an interest in Shaker printed material, or have some pieces in your attic, you must speak to these gentlemen. But Judaica? The partners admit they have no special expertise here. What they do have is a willingness to buy large, complete collections, and this one recently became available. Most of this material will go up online or be sold in the store, although they are willing to entertain offers for the entire lot. And, you can expect the pricing will be very reasonable. This is part of the formula that allows them to buy complete collections. If some booksellers are unenthusiastic about the internet, DeWolfe and Wood are the opposite. Already, a third of their sales are made online. Frank Wood gives a couple examples of what the internet has done for them: they purchased Shaker material from a collector in New York who also had some biology books. They didn’t want them, but took the biology along at the urging of the collector who wanted to clean out everything. They put them online. Every one sold. Another example: they picked up a 1935 doctoral thesis on meat markets in Argentina. How many people collect this? Expecting they would have to throw the piece out, they put it online. It was purchased by someone who told them they had been looking for it their “whole life.” In purchasing a collection of books, Frank Wood picked up some Tetley Tea cards for $100. His partner was not pleased with the investment, but when they put them up for sale online, they discovered there is a whole community of people who collect these cards. They would get calls asking for distinguishing characteristics of the various cards as people tried to fill their collections. The profit margin from the Tetley cards turned out to be far greater than on the books.